PUBLISH introduces a new way to do news, transparently and securely. The team behind TokenPost, the largest blockchain news media in Korea, and Kchain, a leading Korean blockchain consulting group, has launched a new project that aims to bring the benefits of blockchain technology and token economy to the news industry. Dubbed “PUBLISH,” the project aims to create a global blockchain-powered news publishing platform that fairly rewards all of its participants and serves as a realistic and economically viable model for publishers to adopt and build on. The objective is to significantly enhance the existing media structure to make it self-sustaining. The legacy model of the newspaper industry, with its high reliance on advertising revenue, has lost its relevance in the ‘post-truth’ era. Added to this are other key problems which the industry faces at large including fragmented readership, unverified or fake news, and increased competition resulting from media deregulation and consolidation, among others. Based on NEM blockchain, PUBLISH will address these issues by essentially creating an enhanced media ecosystem comprising of news content producers, community editors, advertisers, and ultimate consumers or readers. The ecosystem will be facilitated by NEWS token (aka TokenPost Coin). What distinguishes PUBLISH from other similar blockchain projects on content sharing (Civil, Steemit, DNN, and others) is that PUBLISH does not do away with the conventional role performed by publishers and editors as gatekeepers in the newspaper business. PUBLISH, through its hybrid-decentralized governance and multi-tiered participative editorial system, will improve transparency and publisher autonomy. In addition, it does not exclude advertisers from its token economy – advertisers will perform the necessary function of disseminating information to the public about products and services that would otherwise go unnoticed. 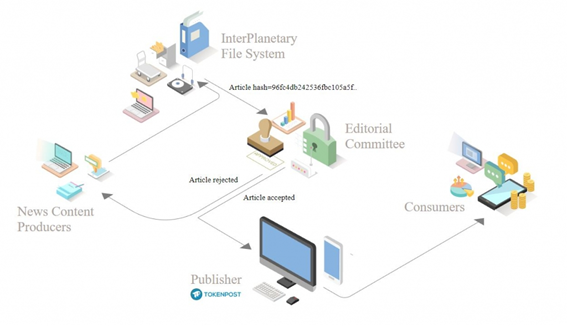 TokenPost will serve as the first protocol use case with NEWS token as the official token utilized within TokenPost’s PUBLISH-based news production ecosystem. TokenPost CEO Sonny Kwon believes that blockchain technology can help solve many of the problems that currently plague the media industry. Publishers can apply to become Launching members at http://www.publishprotocol.io. Those interested in participating in the community can follow PUBLISH on Linkedin and Telegram and subscribe to PUBLISH newsletter to learn more about the platform and token launch. TokenPost, a sister company of the EconoTimes and the organizer of the Blockchain Open Forum, is a professional blockchain media outlet providing news and analysis on trends, companies and key figures in the blockchain industry. TokenPost was also the first media company to issue its own cryptocurrency. As an independent media outlet with reporters located in various countries around the world, TokenPost strives to accurately report information and cover news in an objective and responsible manner, while at the same time providing expert analysis written from a unique perspective.